The theme of this month's Mixology Monday, hosted by PuntneyFarm, is Hometown Hooch. The idea is to use locally-distilled spirits. And, being in Boston, I'm in luck. There are distilleries popping up in the Boston area left and right. I chose to use Folly Cove rum from Ryan & Wood in Gloucester, MA, but there were tons of other options, including Bully Boy, Berkshire Mountain, GrandTen, and the new Boston Harbor Distillery, just to name a few. The current resurgence in local distilleries harkens back to the early days of booze production in the States, when most spirits were made and sold locally. However, Boston had a further reach than most. Its first distillery opened in 1667, and by the American Revolution, gallons of molasses were being imported from the Caribbean every year for Bostons 50+ distilleries to make rum. Rum was the most popular spirit of the time, and Massachusetts was America's leading exporter. But in the 1800's, importing sugar and molasses became more difficult, so most of America turned to whiskey made from home-grown grains. The number of rum distilleries steadily decreased. The final nail in the casket of Boston's distilling industry was in 1919. Purity Distilling Company was operating at 529 Commercial Street in Boston's North End, right at the mouth of the Charles River. They were still in the business of distilling molasses, but not to make rum; during World War I they used it to make explosives, and in 1919 they were mostly producing industrial ethanol. At center of the distillery was an immense tank for storing and fermenting molasses. We're talking 58 feet high and 90 feet in diameter, containing something like 2.3 million gallons of the stuff. And it wasn't in the best shape. It leaked so regularly that residents of the North End would go collect the molasses dripping off of it. It was just after noon on January 15, 1919. It was an unseasonably warm day in Boston, which may have had something to do with what happened next. The tank burst. Its steel plates flew apart, shooting rivets like bullets. A huge wave of warm molasses swept over the North End at 35 miles per hour, leveling buildings, sweeping away cars, and destroying the elevated subway tracks leading to North Station. Twenty-one people were killed and another 150 were injured. 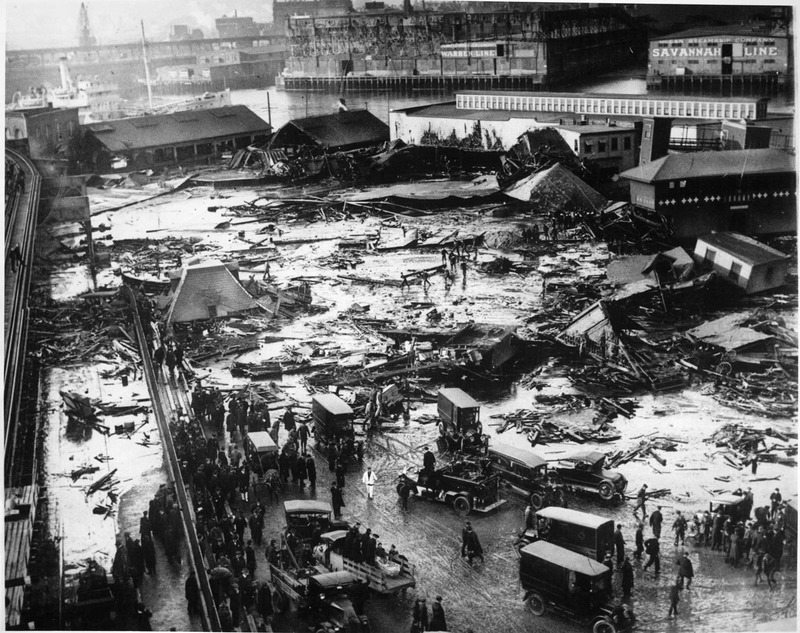 Many who did not drown in the molasses were crushed by debris. 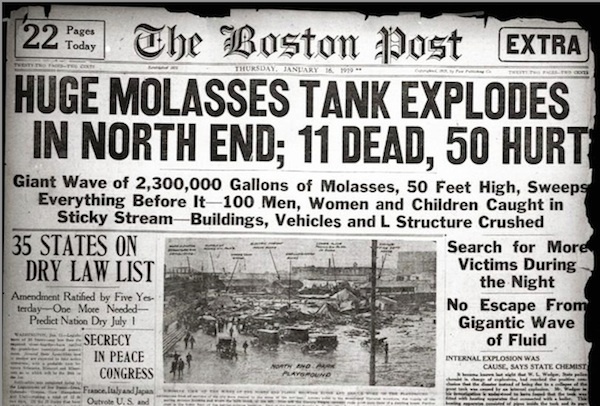 Today the event is known as the Boston Molasses Disaster, or, more irreverently, the Boston Molassacre. They say that on warm winter days in the North End, you can still smell the molasses. The aftermath of the disaster. The cleanup took six months. While it was still ongoing, Prohibition was passed into law. And that was the end of Boston's distilleries. Did the Molassacre actually have anything to do with this? Probably not. But damn, it's a great story. And who knows? Maybe if Purity Distilling had still been around and had 2.3 million gallons of molasses on hand when Prohibition ended, they might have decided to make some rum. The headline of the Boston Post the day after the disaster. Note the article on Prohibition on the left. Now, nearly 100 years later, Boston and its surrounding areas are finally getting back into the game. As soon as I remembered the Molassacre, I wanted to use a local rum for this cocktail. I was a bit down to the wire and the liquor store I went to didn't have Bully Boy or Medford rum, which are actually made inside the city limits, but I came across Ryan & Wood's Folly Cove. It's made in Gloucester, which is about 35 miles north of Boston on Cape Ann. I'm not a rum connoisseur, but I really like it; it's smooth and has such a nice flavor that I enjoyed it by itself. But any rum distilled from molasses would work. This recipe is a riff on the Dark 'N Stormy, which is usually made with Gosling's Black Seal Rum and ginger beer (in fact, Gosling's has trademarked the cocktail, so if you don't make it with Gosling's brand, you're technically not making a Dark 'N Stormy). Add some lime and you get a cocktail called a "buck," though that's not a term you really see anymore. The Moscow Mule (vodka, ginger beer, lime) is a vodka buck. Blackstrap molasses is pretty thick and has a strong taste on its own, so I made a molasses simple syrup by adding it to sugar and water. And let me tell you, after working with it, I do not want to know what it would be like to drown in the stuff. UPDATE: The Mixology Monday roundup is here! Combine rum and molasses syrup in a shaker with ice. Shake until chilled and strain into a rocks glass. Top with ginger beer and garnish with a lime wedge, squeezed and dropped in if desired. *Molasses simple syrup: combine 1/4 cup sugar, 1/4 cup water, and 1 tbsp. blackstrap molasses in a small saucepan on the stove. Heat on low until sugar is dissolved. Do not allow to come to a boil. Let cool before use. P.S. The map of Boston in the back of the top photo is from GeoArtShed. Check them out!